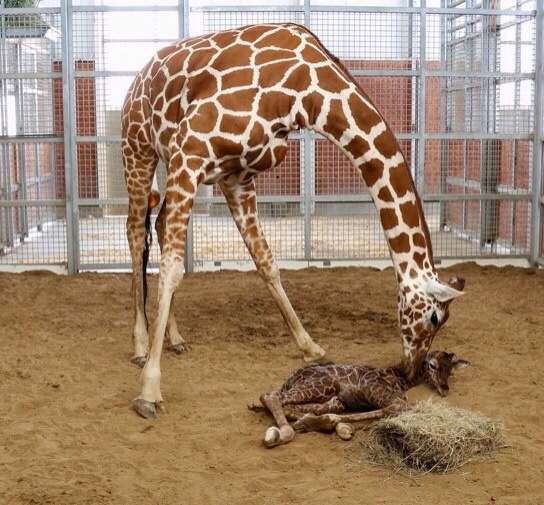 The Dallas Zoo has welcomed a leggy, 6-foot-tall baby giraffe, born Sunday to first-time mother Chrystal. The energetic male calf weighs about 120 pounds and appears to be healthy. The baby giraffe’s wasn’t without excitement. After about two hours, the mama giraffe’s labor stopped and it was determined that the baby giraffe’s head and neck were positioned to the side of the front legs, instead of aligned with them. Giraffe keepers and the veterinary team had closely monitored the pregnancy, including using ultrasounds, and were prepared. The team quickly moved Chrystal into a special, custom-built chute in the giraffe barn. There, keepers were able to restrain her without using anesthesia, a risk they wanted to avoid for the health of both mom and calf. With Chrystal safely ensconced in the chute, the veterinary team moved in quickly and one vet was able to move the calf’s head and neck into the correct position, and the other vet and the giraffe keeper team delivered the newborn safely. After calf, licking him and nudging him. Soon after his mama licked and nudged him, the baby giraffe stood on wobbly new legs, and began to nurse shortly after. Zoo staffers are now observing to ensure the calf is nursing and meeting appropriate developmental milestones. The calf could go out into the feeding habitat, with limited access, as soon as next week. For about three months, the baby and Chrystal will stay indoors together during the evening, until the calf is big enough to be with the herd at nighttime. The calf is a reticulated giraffe, a species with fewer than 4,700 left in the wild, according to the Giraffe Conservation Foundation. The father is the gregarious Tebogo, one of the Dallas Zoo’s most popular residents. Tebogo is the zoo’s only breeding male under the Giraffe Species Survival Plan’s (SSP) program to ensure genetic diversity within endangered species. The Dallas Zoo 12-member giraffe herd is now one of the largest in the nation, with seven males and five females. The giraffes live in the Giants of the Savanna, an award-winning 11-acre habitat in the heart of America’s blackland prairie. The Savanna is the only habitat in the United States where giraffes mingle alongside African elephants, impalas, zebras, ostriches and other animals, as they would in the wild. Eventually the calf will integrate with these other animals.